I realized I haven’t done a beauty product review or recommendation in a while. I’ve always found it helpful for me when searching for a new beauty routine or product to read the reviews of my fellow bloggers. Nothing beats hearing reviews from your friends and colleagues about the products you are considering trying. One product I am always in search for is makeup remover. I feel like I have tried so many and without fail they work great for removing my makeup except for my mascara. I have been known to rub my eyes to the point of loosing some of my eyelashes and even then I don’t seem to get all of my mascara off! 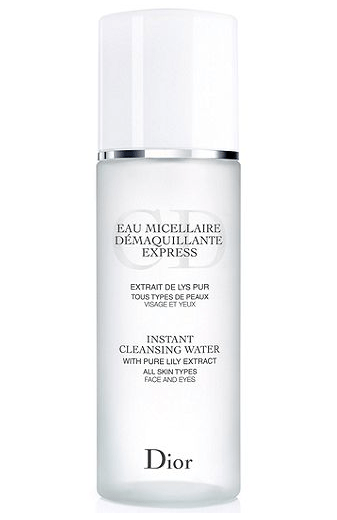 That was until 6 months or so ago when I walked into Nordstrom’s Dior beauty counter and was introduced to Dior Instant Cleansing Water. Doesn’t sound like it would do the trick, but it does. Not only does it remove all makeup, including waterproof mascara, but it also leaves my skin feeling amazing! I would most definitely recommend trying it. I would love to hear what makeup removers you swear by, so please drop me a comment!